INDEX formula – introduction, how to use it and why you should use it? 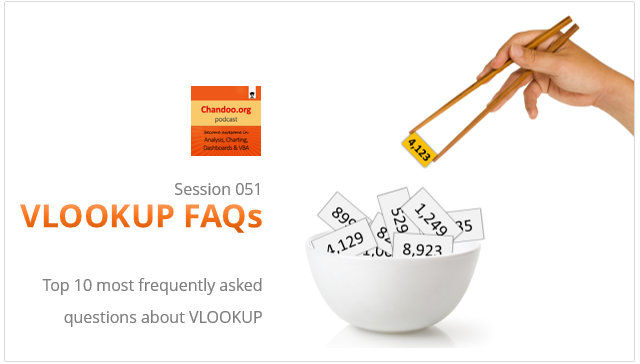 Still have questions about VLOOKUP? Please post them in the comments section. I will try to help you. Hi Chandoo. Happy New Year! When the value you're using to lookup is a numerical ID "number", it will often be formatted as text in an imported list (correctly so, since doing maths with IDs would be meaningless). But any manually-entered IDs will normally be designated by Excel as a number. They may look the same on screen (sometimes with a give-away error checking triangle symbol on the text-formatted cells), but VLOOKUP and MATCH won't work. In such cases, the Text To Columns feature is your friend, as it can change a whole column of numbers into text in one go. However, there's always the danger that IDs starting with zero will have had these stripped while formatted as a number! Thanks for this post Chandoo. The deficiency of VLOOKUP() - it can't do a fast lookup in a sorted, sparse matrix - bugged me. I didn't think of doing two VLOOKUP()s to optimize the calculation time until I clicked your Faster VLOOKUPs with Sorting link (above), that took me to Bill Jelen's article "VLookup tricks: why 2 VLOOKUPS are better than 1 VLOOKUP". My data is approx 20,000 rows - sorted but sparse (not every key value is in the table). Using Bill Jelen's tip reduced the calculation time on my pc from about 4 minutes to under 15 seconds. I wish you continued success in 2016.